Sweet and sticky: that’s a great place to be. 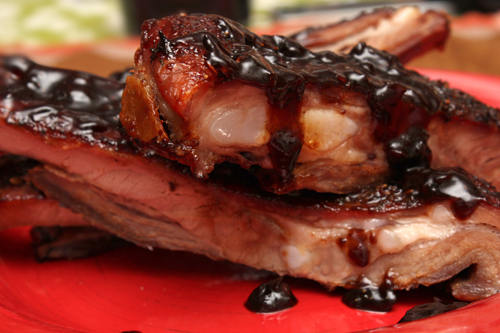 If you can access good racks of pork spareribs, you can share this fun at your table. I reduced the amounts in the recipe for the “Glazed Agrodolce Ribs,” from the August 2015 issue of Food & Wine, using 6 lbs. of spareribs instead of 8 lbs. It’s largely a hands-off recipe, asking for two hours in a low oven. The spice rub is nice (thank you, fennel seeds), which I buzzed together in my food processor. “Agrodolce” is an Italian sweet and sour sauce. You’ll feel like a magician when you make the sauce: two vinegars, ketchup, brown sugar. Know that the sauce reduction takes longer than 15 minutes. Be patient and let it thicken and reduce. After this minimal effort, you’ll enjoy meaty ribs, messy to eat. Win with this. 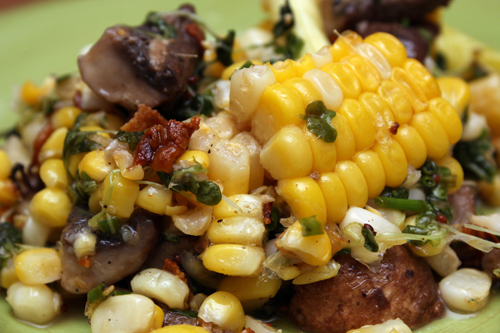 To accompany these fantastic ribs, I made the “Sweet Corn Salad with Pancetta and Mushrooms,” from the September 2015 issue of Food & Wine, indulging in the last of summer’s corn. Like the recipe above, I reduced my amounts a bit here, using 4 ears of corn instead of 6. And now that summer’s fresh ears are gone, I would use 3 cups of good frozen stuff. Cooking the corn and the scallions and the pancetta and the mushrooms -- rather than prepping a raw salad -- deepens their flavors here. The lemony vinaigrette seals the deal. I lost my nerve with using frisee (too bitter? ), so I tossed in some cute microgreens. No shame in that. At the finish line, you get a really good, room-temperature salad. Next time, I’ll play with Food & Wine some more. I’ll make the “Sesame Steak Stir-Fry” from the September 2015 issue, and the “Fried Forbidden Rice” from the February 2010 issue. Come back to my site next week, to see what happens with flat-iron steak and black rice.